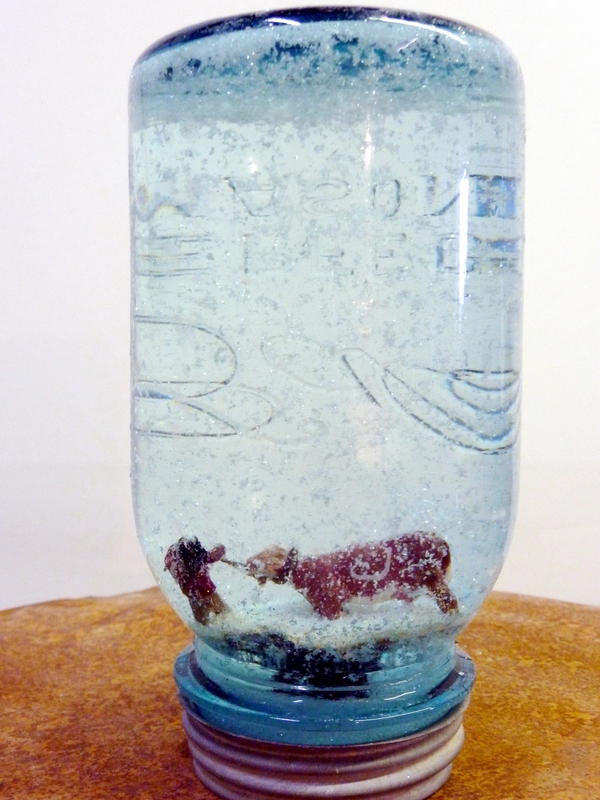 Labor Begins in a Snowstorm; antique mason jar, water, glitter, sculpty clay; 2010. This is in my homemade snowglobe series which depicts the harsh realities of living in the Western landscape in contrast to our romanticized visions. Calving time in the Rockies is often in the spring and inevitably there are many spring snowstorms to contend with. This scene shows a woman rancher trying to get a pregnant cow into cover before she calves. The cow doesn’t want to go anywhere, obviously. This piece was in a group show in the summer of 2010 for former residency artists at School of Visual Arts: “Abstract Intentions” curated by Keren Moscovitch and David Gibson.